Plans are now well under way for our new tractor shed. I’ve been out with Derek looking at suitable trees for planking, (we’ll be using the services of a local mobile saw mill to do this), which will be used to clad the sides. There’s plenty of big trees on The Hurtwood which are too large for the commercial saw mills to take, so using them this way is ideal. 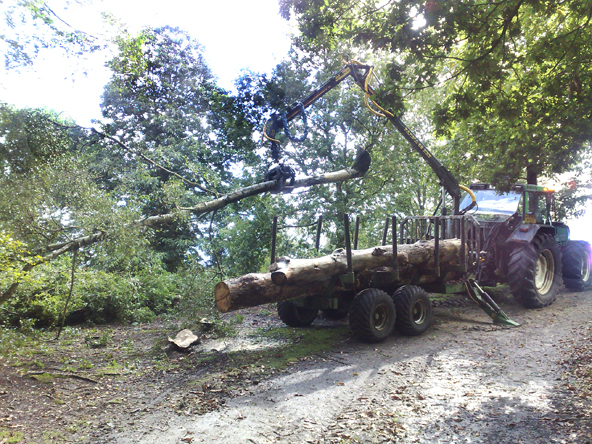 The upright poles which will support the main frame have cut from Pitch Hill sent down to Sussex to be treated then bought back to peaslake. The new tractor sprung a leak from the P.T.O. today, so I phoned the dealer we bought it from, and he sent up some gaskets straight away, a relatively easy job to replace, if not a little messy! I’ve had to do some more re-blocking of an area used by bikers in one of the old Quarries in the side of Mill Plain. First time out with the new tractor last Friday. It took quite a while to get the new Bush Hog set up correctly, but it was worth the time as it’s cutting so much better than our old one ever did. I was going to use the tractor to clear up this lot of mess but I’m still waiting for the new Grab Bucket to arrive. 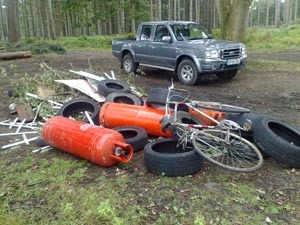 The fly tip was in Radnor Road car park, a lovely collection of gas bottles tyres and tree surgery waste. I ‘ve found a home for the bottles but disposing of tyres is a bit more difficult. Someone managed to re-cycle the bike before I got back to clear it up, shame they didn’t take the rest! A bump on the head! One of the trails I blocked last week has been opened up again, so I decided to put some bigger trees across it. Everything was going swimmingly until the top snapped out of one of the Pines I was felling and landed square on my head breaking my safety hat! 24 hours later my head still hurts. I’m sure a mountain biker would say it was divine intervention. It looks like someone was intending to build some shore on the trail as well, I found this nearby. Yet another wet day! Most of the Mountain bikers I’ve spoken to this week seem to be supportive of the no tolerance for unsanctioned trails, hopefully they’ll spread the word. 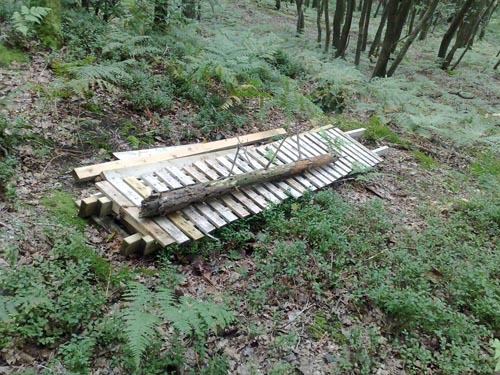 Monday evening saw the Hurtwood MTB trail builders out again on the new entrance avoiding the Hill fort. I helped with the brushcutter making sight lines to work out the best route for the trail, until lack of light stopped play. I recently heard a remark that our new way marker posts were an unnecessary expense and that every one knew where the Hurtwood was. Well some people do, but an awful lot more don’t, hence the little markers letting everyone know when they’re coming onto our land. The cost of the markers was paid for by a grant from The Forestry Commission. Hopefully the markers will lead to a greater awareness about our charitable status, and in turn lead to more Hurtwood friends’. This week I’ve been blocking off new bike trails that have appeared. These trails have been built without our permission. We now have a policy of putting them beyond use as soon as they appear. There is more information about this in the news section of the main site HERE The bike trail that went across part of the Hill fort has also now been blocked and the new route is up and running, but still in need of some minor tweaking. As you can see we managed to put in place some substantial blockades. The new tractor arrived late last week, we managed to get it into the old tractor shed, but had to take the exhaust off. So with the help of one of my contractors, we made some alterations to the shed roof, fits a treat! Welcome to the Hurtwood Ranger’s blog. The idea for this blog came about after being asked “what does the Ranger do” one too many times. For the sake of everyones sanity I’ll keep the blogs short and only post if something of vague interest has occurred, I’m sure you don’t all want to hear about every time I go round the car parks picking up litter! I hope you enjoy this small insight into the Ranger’s world.